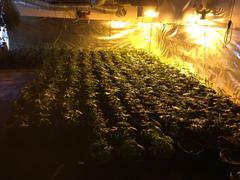 On Friday March 15, 2019, the San Bernardino County Marijuana Enforcement Team along with the Yucca Valley Multiple Enforcement Team, conducted search warrants at seven locations in Yucca Valley and Twentynine Palms regarding illegal cultivation of marijuana. 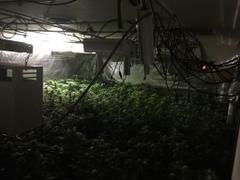 Approximately 5500 marijuana plants in different stages of growth were ceased and removed from the locations. Nine suspects were arrested and booked into Morongo Basin Jail for HS11358 (c), Cultivation of Cannabis and HS 11359, Sales of Cannabis. Anyone with information related to this investigation is asked to contact the San Bernardino County Sheriff's Department, Morongo Basin Station at (760)366-4175. Anyone wishing to remain anonymous may contact We-Tip at 1-888-78-CRIME.